These machines are one of the best tools to make frozen drinks at home. To help to in selecting the best margarita machine we have given here reviews of top selling margarita frozen drink makers. The Margaritaville DM500 Frozen Concoction Maker might be just what you are looking for if you want tasty frozen drinks, which are easy to make. With 450 Watt and a jar that can blend up to 36 ounces at a time, it is certainly promising. You can use the Margaritaville DM500 for any type of frozen drink including pina coladas, margaritas, protein shakes and daiquiris. You also have the option of manually choosing whether you want it to shave the ice like normal or just blend your drinks, depending on how thick/thin you like your frozen drinks. The water collection reservoir keeps melted ice from going into your drink and hereby prevents the creation of watery and sloppy drinks. After conduction our research on the Margaritaville DM500 we found that the vast majority of people were really happy with this product. A lot of people mentioned how they really like the look of this margarita machine and how they loved the small artistic details it had. People really recommended the Margaritaville DM500 for its great consistency in creating perfect and smooth drinks every single time. One customer even said “PERFECT SHAVED ICED CONSISTENCY – JUST LIKE IN THE RESTAURANTS!”. A lot of families with children really liked the fact that they could make slushies, snowball syrup and other desserts for the kids within a couple of minutes. These people also talked about how their Margaritaville DM500 has become almost a social gathering creator and everyone sits around and watches in amazement while creating delicious drinks and ice cold smoothies. Some people also mention how they would have wished they had also purchased the frozen margaritaville frozen concoction maker bag, as all of their friends are constantly asking them to bring over their machine and drinks. Even though 80-90% of the people were really happy about this margarita machine, some people seemed to complain about the icing shaving function. The problem these people seemed to have was that this machine was best suited for creating 36 ounces at a time if you wanted perfect texture and taste. They reported that the results weren’t as consistent when blending smaller portions at a time and they saw this as a minor disadvantage. All in all the Margaritaville DM500 Frozen Concoction Maker is a good purchase for most people, however some of the negative reviews we found in our research, tells us that you should be wary of buying this product and that you will probably be better off buying one of the other models. 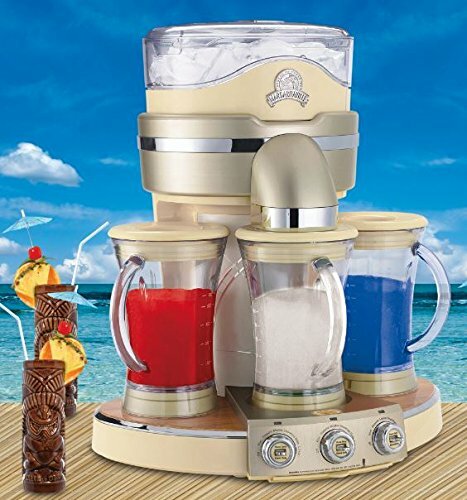 The Margaritaville DM1000 frozen concoction maker is produced specifically for people who want restaurant quality frozen drinks, in the comfort of their own home. Even though it has some resemblance to a regular blender, this device can do much more than just that. It has an automatic function that shaves ice and mixes it into your favorite frozen drink with just the touch of a button. The Margaritaville DM1000 blends up to 32 ounces of your chosen drink at a time and it automatically makes sure to shave just enough ice, to create the perfect drink. It’s intelligent function of automatically measuring how much ice is need for the number of drinks you choose, guarantees you drinks that are neither too chunky or too watery. We found almost 150 independent reviews for this product and the feedback is overwhelmingly positive. The majority of people rave about how the Margaritaville DM1000 creates drinks that have a very smooth consistency and are not chunky or lumpy in texture. Almost everyone also talked about how the consistency of this product was amazing and that it literally created restaurant like frozen drinks every single time. This machine certainly lives up to his guarantee of creating high quality drinks consistently. When it comes to ease of use everyone pretty much agreed: The Margaritaville DM1000 is easy to operate and has a couple of functions that simplify the process of creating frozen drinks even more. One of these functions that everyone really liked was how the margarita machine, automatically measured how much ice it should shave and blend according to the amount of servings you chose. This eliminated watery drinks and left the customers with perfect drinks they could take credit for. The next popular feature was the fact that the ice chamber had a so-called collection reservoir. This means that when the extra ice would melt, it would simply go into this collection reservoir that is easily removable, instead of going into your drink and making it watery. A lot of people also mentioned the great flexibility the Margaritaville DM1000 has. They didn’t use it only for Margaritas, but for making pina coladas, daiquiris, protein shakes, smoothies and even for mixing together various fruits in order to create a power drink. Last but not least people just love the customer service from Margaritaville. According to our research the Margaritaville DM1000 Frozen Concoction Maker is a high quality product that really lives up to its promises and guarantees. It is easy to use, efficient and creates outstanding frozen drinks. All the people who took the time to rate this product were really impressed and recommended the this margarita machine to anyone considering purchasing it. The Margaritaville DM900 battery- powered Frozen Concoction Maker is one of a kind in the flexibility and quality it delivers. It comes with the same high quality and consistency as the other Margaritaville models but has the added benefit of being battery powered. The battery is an 18 volt rechargeable unit and delivers enough energy to blend up to 80 drinks in one single charge. You also have the 4 different preprogrammed cycles that allow you to create margaritas, mudslides, daiquiris and smoothies with the touch of a single button. Because of the fact that it is battery driven you can take this frozen drink maker with you to the beach, boat, picnics or just use it in the comfort of your own home. The battery runs on DC motors similar to the ones that are used in cordless power tools. This margarita machine is created for people who want total freedom and are on the move a lot. We were really excited to get to do research on the Margaritaville DM900 as we were curious to see how a cordless application would do compared to its electrical counterparts. More than a handful people had taken the time to review this product and all of the feedback was highly positive. Especially people who are adventurous and are camping, boating, picnicking and BBQ’ing on a consistent basis really love the idea behind this product. Several people had stories to share of how they had taken the Margaritaville DM900 with them on their boat trip, picnic, hike or on the beach and had gotten stellar results when they finally stopped to mix a ice cold drink. Some people were even so impressed with the efficiency and speed of this mixer that they joked about bringing it to football games and selling ice cold frozen drinks. The Margaritaville DM900 seems to give close to same, if not the same results as its brother and sister models from the same line, with the added benefit of being cordless. If you are an avid traveler or someone who is constantly on the move and lives an outdoors type of life, this is the mixer for you. If you are more of a relaxed stay at home type you should check out our test winner the Margaritaville DM2000 margarita machine model as it might be more fitting to your needs. All in all, our research found the Margaritaville DM900 battery- powered Frozen Concoction Maker to be a high powered and solid solution for anyone who wants to enjoy perfect frozen drinks in an outdoor setting. The Margaritaville DM3000 Tahiti Frozen Concoction maker is the ultimate creation when it comes to creating your own homemade frozen drinks. It has not one or two, but three independent mixing stations that all deliver restaurant like frozen drinks with the push of a single button. 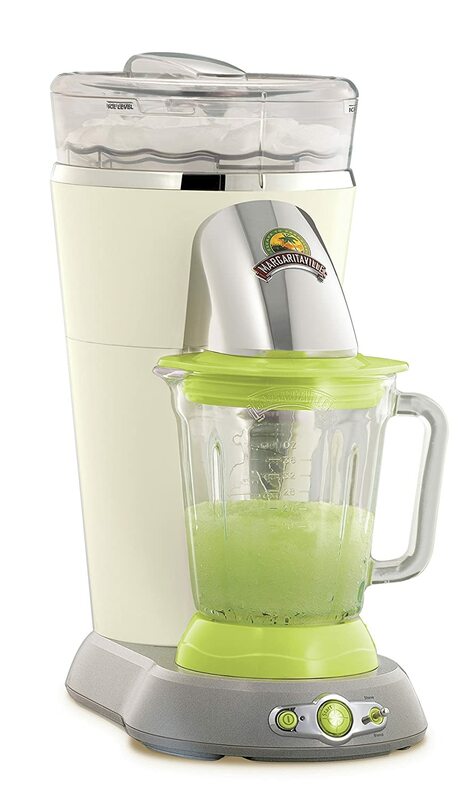 The Margaritaville DM3000 has 6 different drink types: (other models have a maximum of 4) margaritas, coladas, daiquiris, mojitos, mudslides and smoothies. It quickly becomes the center of the party with its turning ice cute and incredible power. Designed with high end bamboo with an aluminum and stainless steel finish, it looks both stylish and high end. You can make up to 72 ounces of frozen drinks at a time, making this product ideal for large parties and big BBQ events. Initially we didn’t want to research this product as we didn’t think anyone was interested due to the relatively high price. However, we quickly realized that not only did this product have solely positive reviews, but it had reviews from people who were literally blown away with the functions of the Margaritaville DM3000 margarita machine. This product basically has everything. A lot of people love the flexibility of this product in that you can use it for both small family events to create a couple of frozen drinks and you can use it at large parties to literally create pitchers and pitchers of perfect drinks. A lot of the reviews talked about how they use their Margaritaville DM3000 for everything including frapuccinos, smoothies, slushies/snowcones for the kids, margaritas etc. One of the major things people loved about the Margaritaville DM3000 was how it instantly pumped up the party and became the topic of conversation. As you can see in the video posted above it is fun to watch in action and very easy to become impressed with. Several people gave feedback about how even their guests that were usually wine and beer drinkers switched over to frozen drinks after seeing the Tahiti in action. A lot of families with children really love this product and the kids went completely wild when they started up the Margaritaville DM3000. This is basically the ultimate frozen drink maker and is suited for people who want to instantly become the party masters. The price is higher than our test winner the DM2000 model, but if you are looking for something spectacular, effective and fun, the Margaritaville DM3000 is definitely worth considering. Our research was very clear and 95% of the feedback on the Margaritaville DM3000 Tahiti Frozen Concoction maker was very positive. We can recommend Margaritaville DM3000 to anyone who is looking for something that is unique and is going to blow away your guests with amazement. The Margaritaville DM2000 Premium Frozen Concoction Maker is one of the high end models from Margaritaville and comes in a beautiful aluminum design. Because it is one of the highest quality models from their line, it also has the commercial UL approval meaning that it can not only be used in your home, but also in a restaurant setting. The ice container of this model is two times bigger than its little brother the DM1000 model and it comes with four preprogrammed ways of blending, giving you the possibility to choose between margaritas, smoothies, mudslides and daiquiris. It has an automatic shaving function that automatically mixes in the right amounts of shaved ice for perfect and smooth drinks. It also has a manual shaving function that gives you the ability to make your drinks thinner/thicker than the preprogrammed standard cycle. Our research on this product was filled with owerwhelmingly positive feedback from users and 95% of the users gave the Margaritaville DM2000, either 4 or 5 stars out of a possible 5. The first thing users really love about this product is the great diversity it has. Most users packed away their regular blenders when their Margaritaville DM 2000 arrived and some people even packed away their snow cone and dessert machines. One user talks about how she easily makes low calorie frappuccinos that are just as good as Starbucks by blending milk, flavored coffeemate creamer, instant coffee, splenda and a little syrup. Other users reported on how they easily made banana daiquiris, pina coladas, smoothies and margaritas. All the reviews say that cleaning the Margaritaville DM2000 is very easy and that they just put the jar and its components directly into their washing machine. What really seems to be the major winning point however, is the high quality and consistency in which it creates drinks. A lot of people say that you can create really smooth and delicious margaritas in under a minute and compare its effectiveness to something you would get in a restaurant. In our research we found that people are quite impressed with the sturdiness and power of the Margaritaville Dm2000 and felt like a professional drink makers when creating their beverages. Last but not least everyone seems to be raving about how the margaritaville dm2000 margarita machine becomes the focus of the party within just a few minutes. All the guests seem to love it and talk about how they should buy their own version. According to our extensive research the Margaritaville DM2000 Premium Frozen Concoction Maker is our test winner out of all the other models. The sturdiness, power, consistency in making great drinks, commercial UL approval and the fact that almost everyone who took the time to write a review had something positive to say, makes this product a solid purchase. Its very easy for us to recommend the Margaritaville Dm2000 to just about anyone looking to make perfect frozen drinks.